The summer of 1975. Felix and Boz travel across Europe to Matala, Greece, looking for love and adventure. Or whatever comes their way. A funny and quirky tale about seeking love, evading responsibility and coming to terms with adulthood. Mike Manson is the author of ‘Where’s My Money?’(Tangent Books). He is an editor of the Bristol Review of Books and was chair of the judges of the 2009 Bristol Short Story Prize. A really entertaining book. This would make a great film too. a gem of a read! 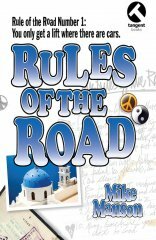 During such depressing times, it was wonderful to pick up Mike Manson's Rules of the Road and laugh out loud! I have now read this book twice, and I laughed in different places each time. It's just what I needed to cheer up a British winter.